Provide your backyard birds a classic and charming roost with this Home Bazaar Cherry Hill Bird House. This structure evokes American homes built in the early 1940s, with striking detail and color on every side. Faux windows dot all four sides of the abode, and flower boxes beneath them sport fabric flowers for added design. Dual dormers on one side of the roof add exciting angles to the piece, and a stone covered chimney enhances the natural look. An imitation screen door rests on the front of this home, while a 1.25" diameter entry hole sits above it. This allows your feathered friends to enter the item, and a piece of screen beneath it helps fledglings exit the nest when ready. The back panel on this house unscrews for cleaning or nest checks, and six holes beneath the roof overhang keep the shelter well ventilated. The shingled, pitched roof protects this unit from precipitation, and its black color contrasts the red and white body perfectly. The wooden construction forms a comfortable roost, and its flat base makes placing the item simple. An included mounting plate allows you to display the home on a 4 x 4 post (not included), or attach the included hardware and hang the item from a bracket or hook. 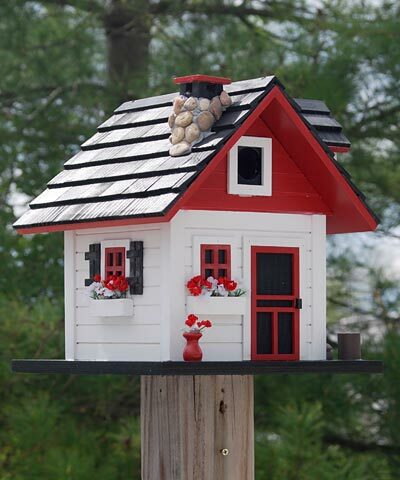 Add classic color and architecture to your bird garden with this Cherry Hill Bird House. Note: Climate and the elements will weather the house and change its appearance over time; however, weathering will add to the home's natural charm without compromising its function. Should you want to preserve the finish (paint), it is recommended to cover it with several coats of a water-based sealant. You should expect that once left outside, the product will weather and require refinishing.